Hyper-smooth ceramic nano coating protects for 12+ months! CarPro Gliss v2 is a hyper-smooth ceramic nano coating that adds an incredible layer of gloss and protection to your paint! Traditional waxes and sealants are great, but there are times you want to apply more gloss and a more durable form of protection. In these instances, a coating can really make the difference you are looking for. CarPro packed Gliss with modified long chain carbon-fluorine polymers and enhanced nano-technology, which allows this coating to not only apply incredibly easy, but add a durable form of protection to your paint for 12+ months! The hyper-slick and hydrophobic protective layer increases resistance to, static buildup, dust retention, and many types of mineral and water stains. This helps keep your paint cleaner longer, along with making future cleanings much easier. The extreme hydrophobic properties Gliss can be used as a stand-alone coating, or as a topper to existing coating layers. If you do use it as a topper, Gliss will enhance the gloss and life of the existing coating layers. This versatile product is great for anyone who wants strong protection and beautiful gloss, pick up a bottle today! What I like about this product is the haze is a very clear indication that the excess product is ready to be removed. It is also very easy to work with if you do let it sit too long, simply re-wetting the surface with the damp applicator and immediately removing solved the issue for us. So far, Gliss looks to be a great addition to the CarPro lineup. May be used as stand alone or top coat. Drag one line of product across length of suede wrapped applicator. Apply evenly across surface approximately 24" Sq (60cm2) at a time. Wait until white haze forms and immediately wipe all residue off using a microfiber. If haze is left on too long then reapply and immediately wipe off. If layering on top of itself, wait 1 hour between coats. If IR cured may repeat immediately. Total cure time: 12 hours. May be applied 4 hours or longer after CQuartz. If CQuartz was IR cured then only 1 hour is needed. Gliss may flash slightly faster when applied over CQuartz. Wash regularly with CarPro Reset or Ech2o. I put it on a dark grey metallic truck over 2 coats of cquartz uk3.0. Had a hard time seeing it flash.Did not notice much of a different shine from uk3.0. But it did make it more slick. I love this stuff. If you are going to ceramic coat your car, there is no reason not to use this to get the most out of it. I have not been able to offer a paint coating for my customers due to the long set up time. I do my car detailing outside and so applying a paint coating and waiting for them to set up was a pain. Carpro Gliss was a good suggestion that I received on a detailing forum. I bought some to try and all I can say is, "Wow!" I do not think that this is a real paint coating, but it is easy to apply. If you can apply a sealant then you can apply this product. 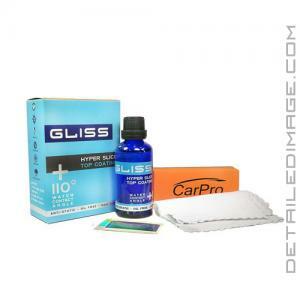 I have applied Carpro Gliss to a few customers cars and they love it. Yes, I am buying more. Yes, I am using this as a standalone product. Yes, I am happy with this product.